Whether you’re always conscious of your weight and you could use a scale upgrade or you just want to prepare for your inevitable New Year’s resolution in a couple of months, we’ve got a killer deal for you to take advantage of on Wednesday. 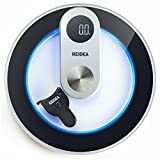 The Vodool Smart Wireless Digital Bathroom Scale is a top-rated option with all the bells and whistles you would expect, such as user profiles and a connected app. But there are two things that set this scale apart. First, it also measures BMI, which is a feature typically reserved for higher-end scales. And that leads us to the second thing: it’s insanely cheap! Use the coupon code Y78NTIDE at checkout and you can get one for just $23.79. KNOW YOUR HEALTH: The 13 comprehensive metrics provide accurate data for weight, BMI, TWB, BIA, body fat percentage, subcutaneous fat, visceral fat, estimated water, skeletal muscle, muscle mass, bone mass, protein, basal metabolic rate and metabolic age. PRECISE MEASUREMENT: Thanks to the dual frequency biological electrical impedance that provides intelligent detection to extracellular fluid content. Range of body fat scale from 0.4 to 400lb. (0.2 to 180kg). APP RECORD & DATA SYNC: Download Feelfit from the App Store or Google Play. Get all your health data collected and analyzed automatically with a simple touch on your LCD screen. Sync data also with Apple Health & FitBit to keep track on your mobile phone. UNLIMITED USERS: HUTbIT can store all information of unlimited users. It recognizes instantly when a user steps onto it. Add your family members’ profile and get the data displayed on the app at a glance. SLEEK & ERGONOMIC DESIGN: The Smart Body Weight Scale is simple yet very elegant; stylishly displaying everything you need to know about your body’s composition. Now Upgraded with hidden LCD display. The 284mm Ultra-white tempered glass can support heavy weight and is water resistant.